Elementary Shenanigans: Extreme Makeover....PUMPKIN EDITION!!!!! No, really ALL of the credit goes to my amazing room moms, one room grandma and the most fabulous woman I know...my mom! My kids could hardly wait to get into the classroom today and I am pretty sure that they worked harder than ever before! If they would keep up the speedy pace, I may just decorate pumpkins everyday! Ok, ok...I am not THAT crazy! We had a blast and the kiddos can't wait to present their book reports next week! Introducing our 2011 Pumpkin Parade! We are still adding a few minor touch ups here and there tomorrow! My sweet kids just couldn't get enough of these pumpkins and will be talking about them for weeks! 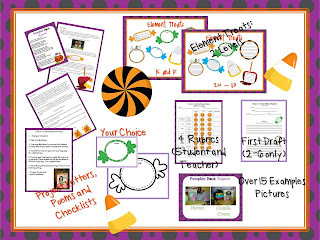 If you would like more information about the pumpkin book reports, you can check out my unit on TPT! Is it bed time yet??? This is ONE tired teacher! Whewww! I love this idea!! Great job! I bought your unit and love it! The kids are turning in their reports and pumpkins on Monday I am so excited to see them! I wish we had time in class but I had to have them do it at home instead :( Oh well! Also, I bought your Trick or Treat writing and made the ghost riddles into my bulletin board...everyone loves, loves, loves it! Students have been caught by other teachers I was told when "going to the bathroom" to come look at my board! So funny!!! These are FABULOUS!!!! I HEART Junie B so that's my fave, too! AWESOME! SO STINKIN' CUTE!!!! I can't wait to do this next year!!! I bought your unit a couple of weeks ago and our system just went 1 to 1. We completed the pumpkins with kids and then we took our macbooks and recorded them like they were a newscaster. They reported from the pumpkin patch, told about their project and story. It was very cute. I am turning those into a slideshow to show for PTO night next week. Thanks for the great unit! Adorable pumpkins!! I love the pumpkins dressed up as characters. I think it's such a fun and creative way for kids to have fun and learn! Wow! What a super cute idea! You are so creative! I am a new follower of your blog and look forward to reading it in the future! From--Your 'childhood' art teacher! :) PS-Make sure to come and check out my blog SOON! (will be up shortly) Art n Craft Coach.com! This is a wonderful idea! Thank you for sharing! Such fun and makes a book report even more fun to do! I can't wait to try this out next year. What kind of paint did you use to do there?